Here’s the latest in my Artificial Emotional Intelligence series for AlphaBots. I’m learning quite a bit about emotions in researching this project. Except that I’m ending up with more questions than answers. For instance, disgust to me seems absolutely fundamental & visceral, more physical than mental at least in its roots, yet some think it’s an emotion that must be learned. I suppose that’s true in some cases, but if you’ve ever seen a baby eat something bitter, this robot’s expression will look quite familiar. I recently read an article about people with trypophobia– extreme revulsion at the sight of clustered holes. I found most of those images appealing actually, but I love all sorts of patterns in nature. On the other hand, hair in a bathroom drain gives me the major creeps, beyond all reason. There does seem to be a fair degree of variability & irrationality involved in disgust. What disgusts you that others don’t mind? What do you find tolerable that grosses others out? Do you think these reactions were “hard-wired” or did you acquire them over time? Do you find context important? 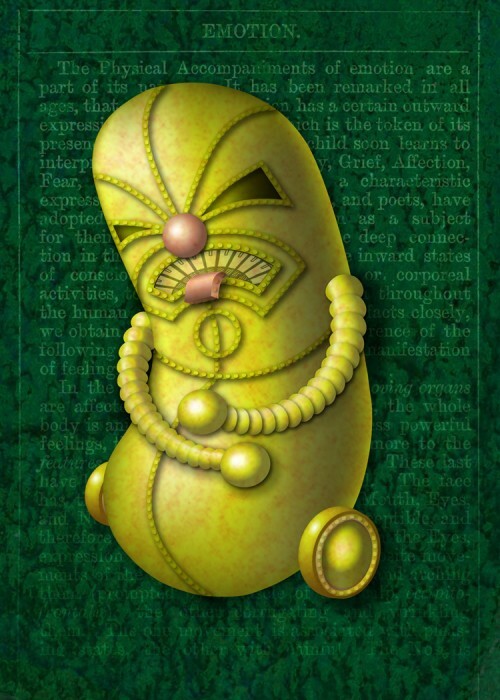 Do you think disgust is always related to fear? I tried to make this robot look something like a bitter pill, or perhaps a bacterium of some sort… luckily a shape that Illustrator’s gradient mesh seems to comprehend a little bit more easily. That gave me time to get a little carried away with a rivet effect using the dotted line stroke. My Illustrator interest may have crossed the line into obsession. The other night I dreamed I was trying to control my husband’s snore volume using Bézier curve handles, & getting very frustrated with Illustrator when it didn’t work! Perhaps that’s my subconscious telling me that I’m asking too much of this program? In this case an old-school poke in the shoulder was much more effective. ;-) At least I woke up laughing, which isn’t always the case when the snore volume goes to 11! This entry was posted in Curiosities, Experiments, Uncategorized and tagged Adobe Illustrator, Artificial Emotional Intelligence, Creatures, Robot on 25February 2013 by Leah. Recently I was listening to the Brain Science Podcast, & the subject just happened to be The Origin of Emotions. Jaak Panksepp was talking about the evolution of emotions, & to my surprise, he proposed that the very most fundamental emotion was the “seeking instinct”– he didn’t use the word “curiosity” but of course that’s what jumped into my head. I hadn’t even thought of this as an emotion per se, but it makes perfect sense! The same essential impulse that sends any animal out into the world in search of food extends to send me in search of interesting podcasts & new program skills,* for instance, or the Curiosity Rover to Mars, or this robot in search of odd little green thingies! It was a fascinating podcast in general, & if you’re not the podcast type there’s a pdf transcript of the interview available here. *For this Bot I learned how to use the star tool (for the pattern in the irises– super-easy) & the object blend tool (for the goose-neck & arms– quite a bit more complex but fun & amazing)! And don’t forget to check out all the other C robots over at AlphaBots! 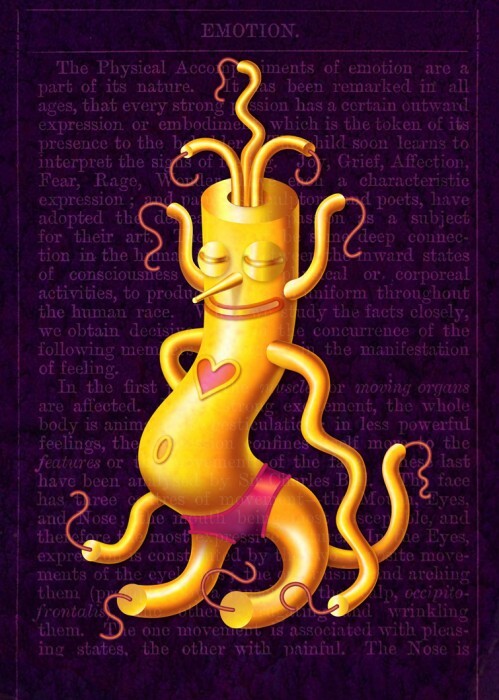 This entry was posted in Curiosities, Experiments and tagged Adobe Illustrator, AlphaBots, Artificial Emotional Intelligence on 18February 2013 by Leah. I decided my theme would be Artificial Emotional Intelligence. 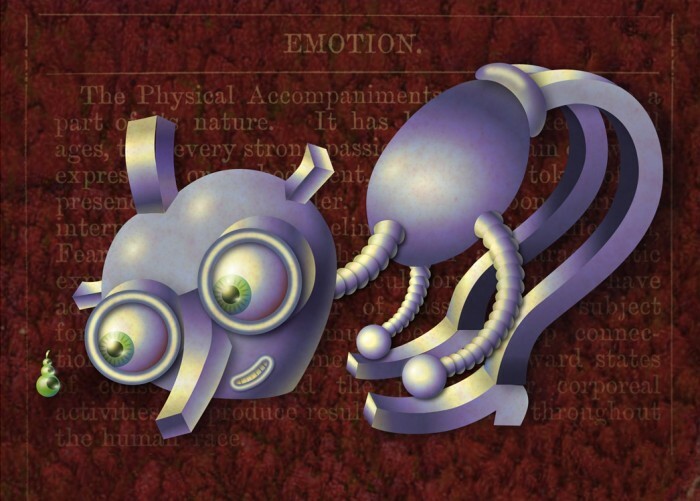 Each bot will represent an emotion. Should be fun! I also decided (probably very foolishly) that AlphaBots would be the perfect opportunity to teach myself Adobe Illustrator. (AI for AI, get it?) I’ve used it now & again for some type/lettering work, but I’ve never tried to make an image with it before. It’s a whole new world & cranking out this simple little bot nearly drove me crazy! I’m still not at all happy with the gradients & such. I hope when I learn the ropes a little more I can touch him up, poor fellow. Appropriately enough, I started the alphabet with angst– I certainly felt enough of it as I was attempting this effort! The background text/texture is imported from Photoshop, as is the little belt buckle ornament, but everything else is AI. Wish me luck with this project! I hope the next one doesn’t take this long! 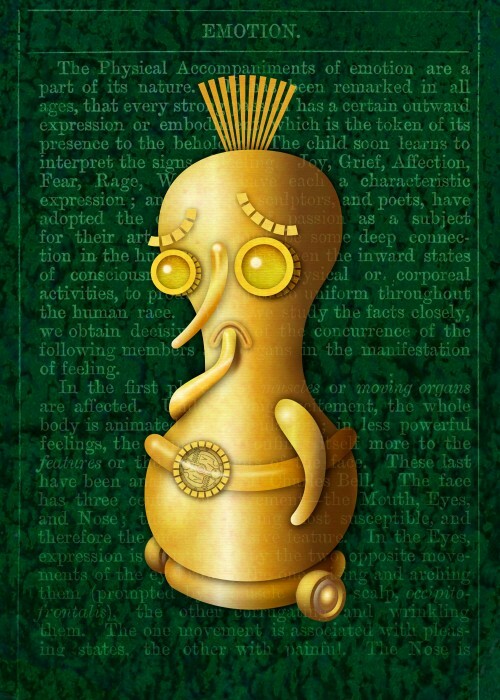 This entry was posted in Curiosities, Experiments and tagged Adobe Illustrator, AlphaBots, Angst, Anxiety, Artificial Emotional Intelligence, Emotion, Robot on 14February 2013 by Leah. 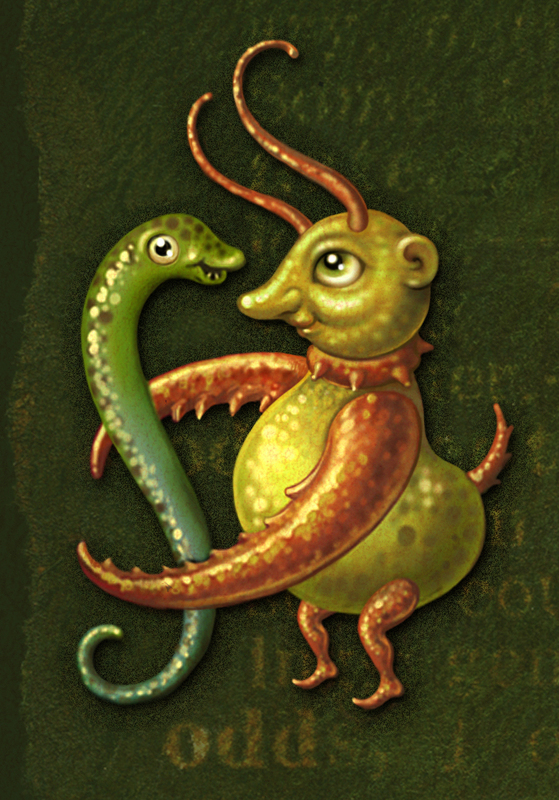 At some point I’m going to import all my previous blog content into this site, but until then, if you want to see some of my older art, check out my Oddments blog. This entry was posted in Curiosities, Experiments, Uncategorized on 12February 2013 by Leah. 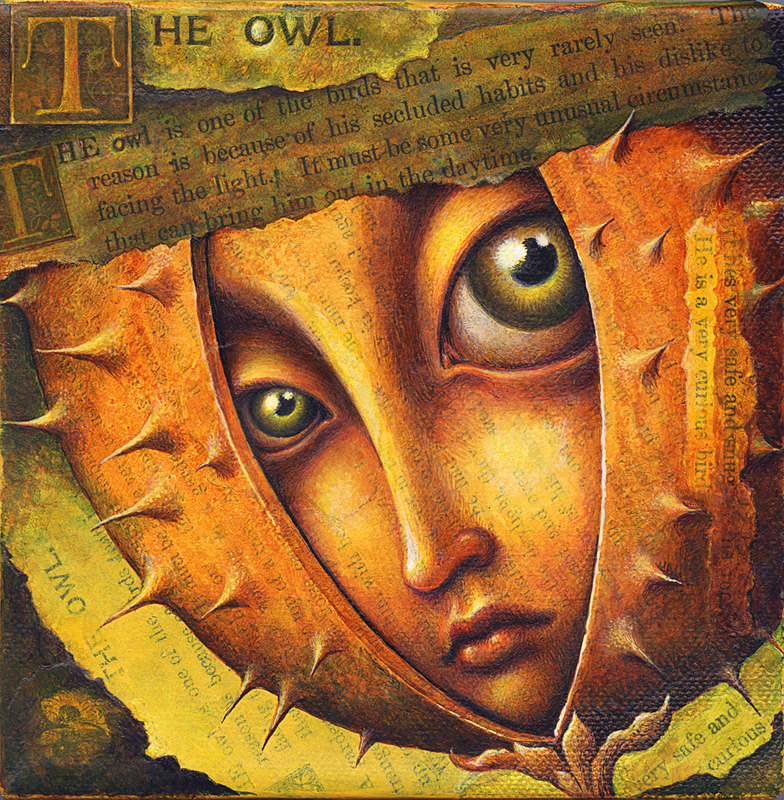 Secluded Habits Acrylic on collaged text on canvas, 6"x6"
This entry was posted in Art, Paintings, Uncategorized and tagged Acrylic, Art, Collage, Eye, Leah Palmer Preiss, Owl, Painting, Prickly, Shell, Shy on 1February 2013 by Leah.